Ultimately, this new military student identifier, required by law, could improve the educational experience for military children over the long term, and possibly provide extra information for parents to consider if the school is an important part of where they choose to live when assigned to a new duty station. Because of the mobile military lifestyle, these children change schools frequently, and some have difficulty making the transition for a variety of reasons. Many military children are resilient, even in the face of these transitions, parents’ deployments and other military lifestyle issues. But scant information has been available about how well military children as a group perform in school. The vast majority of military children attend schools run by local school districts; only about 73,000 students attend DoD-run schools. But there's been no discussion of arming teachers. The military student identifier is part of the Every Student Succeeds Act of 2015 (ESSA), and simply flags a student as being the child of an active-duty service member. The question is generally asked in the registration process. Parents are not required to respond to the voluntary question, but it’s encouraged to help educators better understand the needs of the children, and to make sure programs are meeting the needs. The child is anonymous in data that’s reported to the state and national levels, like other data reported for years on subsets of children based on ethnicity, gender, eligibility for free- and reduced-lunch, and other elements. In addition, schools are now reporting on foster children and homeless children. Schools will know who the military children are. The school level is where the Military Student Identifier will make the biggest difference for families, because more educators will now know about military-connected students in their classrooms, said Mary Keller, president and CEO of the Military Child Education Coalition. For more than a decade, that organization has advocated for a way to identify all military students, so districts and states know how these students are performing in schools, and to take steps to help those students thrive. It’s important for military families to be aware of the change, said Christi Ham, chairwoman of Military Families for Higher Standards. There’s now a way to let school districts know their child has a seat in their school, she said, and that if situations arise or a need arises for specific services, it won’t come as a shock to districts. Many military parents have said they hope the information from the new requirement will eventually provide more publicly available information about military children’s assessments as a group, which will help parents shop around for the best school for their child as they prepare to move to a new duty station, Ham said. Meanwhile, the Lexington Institute has just released a report highlighting some practices schools are currently using that might help other school districts use the information they’ll get as a result of the military student identifier. States put different emphases on what factors they report – such as test results, promotion to the next grade, and getting credits to graduate on time, to name a few. So it’s not yet clear what an analysis could provide at a national level. And military students won’t be tracked over the long term as they move from state to state. But the specific identifier will allow states to look specifically at military children’s performance as a subset of the school population, just as they have in the past looked at other subsets. The academic performance of students in states with large populations of military-connected students varies “dramatically,” according to a new study about the challenges that affect military children’s education. 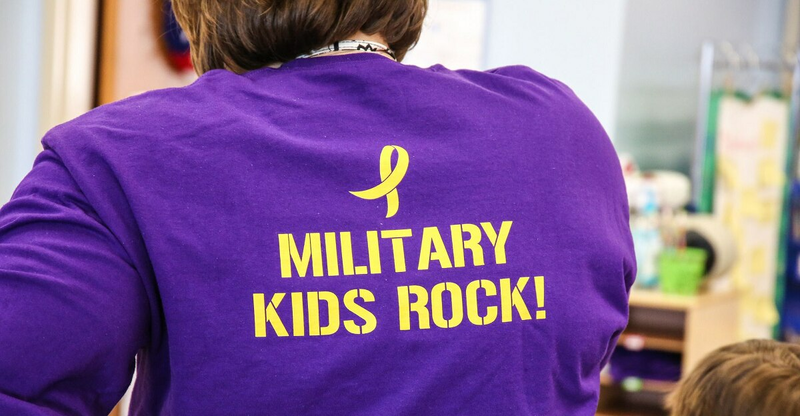 Over the years, through various forums, educators and advocates have highlighted some practices that school districts have developed to help military children succeed, long before the military student identifier became law. The Lexington Institute’s new report looks at some practices in seven school districts that are aimed at helping military children succeed. Knowing that a child is military connected can help schools determine what might be needed in terms of instructional support as well as social-emotional support, Mesecar said. For example, if a child is struggling in reading, it may help to know she transferred from another state, and may not be fully up to speed on the standards being used by the new state, so she may need some targeted instruction and support. In Virginia Beach City Public Schools, Virginia, two counselors are dedicated to supporting military children and families across a range of issues, such as academic transfer challenges like getting up-to-date transcripts, acceptance of credits, and course completion. District officials have found that military families come with different levels of preparedness, and that enlisted families tend to need more support. Having additional information from the military student identifier should help schools more quickly identify these children and their needs, according to the report. Mesecar said he was struck by how important the social-emotional aspect is, and noted that some schools go out of their way to make military children feel welcome. The report cited service clubs like Student2Student, which includes military and civilian students who greet new students, give tours of the school, and invite the new student to lunch. Student2Student programs were started by the Military Child Education Coalition in 2004, recognizing this need. One element important to school districts’ success is having clear staff responsibilities for the performance and well-being of military children. Another is having high expectations for all students. School districts also need to have a good working relationship with installation officials, understanding the mission of the base; and base leadership needs to understand the needs of the district and how they can help in ways that benefit all students. For example, Columbia County School District and Fort Gordon, Georgia have developed strategies to address the issue of transitioning military students, ranging from improving the timely transfer of student records to providing information on graduation requirements.